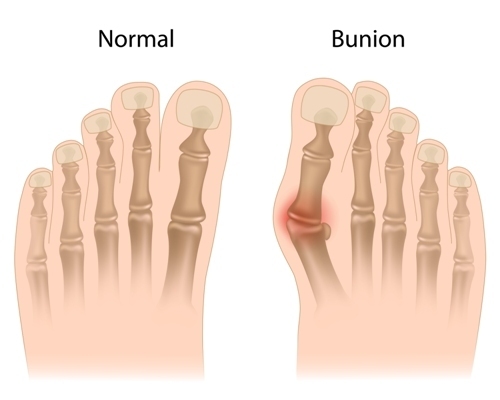 A bunion is a bump that appears to “grow” out of the inner portion of your foot at the base of the big toe. They vary in size and can be very painful. 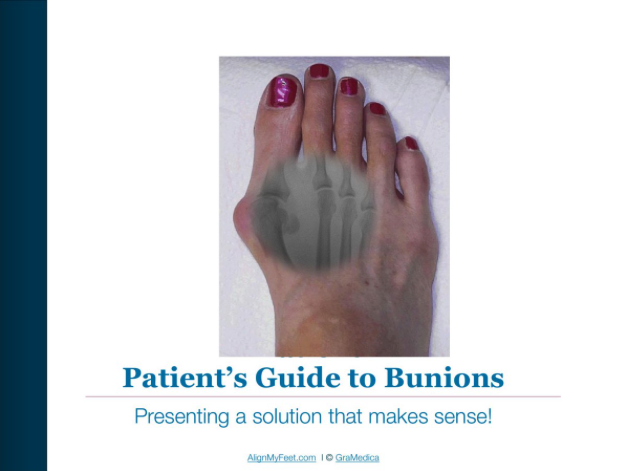 Some bunions are congenital (you are born with it), while others have been brought on by some sort of trauma to the foot. A common myth is that bunions occur from wearing high heels or tight, ill-fitting shoes. While it is true that this can aggravate the foot and make a bunion worse, the problem starts with misaligned feet. If your feet are aligned, your ankle bone (talus) sits directly on top of your heel bone. The front edge of each bone is almost aligned with the other. (The edge of your ankle bone slightly overlaps the front edge of your heel bone). If your feet are misaligned, your ankle bone falls forward and out of line with your heel bone. This pushes the rest of the bones in your forefoot forward and puts a tremendous amount of pressure on the bone just behind your big toe, called the first metatarsal. Every time you take a step, the first metatarsal takes the brunt of your entire body’s weight. Over time, this causes the first metatarsal to shift abnormally. Your big toe naturally wants to fall in line with your other toes, so it will bend inward leaving the first metatarsal to compensate by bending outward, which is what forms a bunion. This is why high heels and ill-fitting shoes play a large contributing factor to the formation of a bunion. They cause even more pressure to be put on the first metatarsal by pushing the already unstable foot structure into an abnormal shape. HyProCure fixes the issue at its root by realigning your ankle bone to keep it from sliding forward and off of your heel bone. This keeps the rest of your foot in its normal position so that when you walk, your weight is distributed evenly, eliminating the excessive pressure on your first metatarsal.